Ed Kainen, '88, was named Las Vegas Attorney of the Month in ATTORNEY AT LAW Greater Las Vegas Edition. Kainen is the founder of Kainen Law Group, PLLC, a family law firm in Nevada with veteran attorneys. “If you do it right, family law is incredibly fulfilling. A lot of times you’re going through an emotional war zone, so an attorney has to deal with and manage the clients’ frustrations while championing their cause. It really is an unbelievable balancing act,” said Kainen. Kainen mentioned two significant achievements as benchmarks of his firm's success, according to the magazine. After litigating against each other for 20 years, he added Neil Mullins as a partner. And, the firm moved into a new 10,000 square foot building, which led to a collegial environment. Another of Kainen's partners is Andrew Kynaston, '02. Both Kainen and Kynaston have received Pro Bono Lawyer of the Year from the Legal Aid Center of Southern Nevada, the only time that two lawyers from the same firm have done so. Pro bono service is a commitment for all members of the firm. The article mentioned, "part of his management philosophy is to surround himself with the smartest, most capable minds possible. He finds their intelligence to be an asset to himself and his practice." 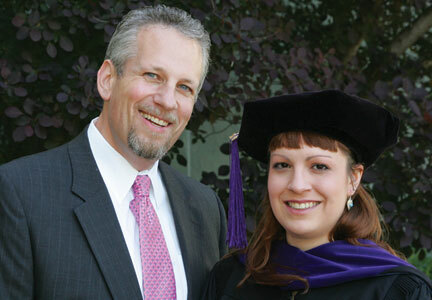 Kainen's eldest daughter, Racheal Mastel, '09, is also an attorney at Kainen Law Group. Kainen currently serves on the Washburn Law Alumni Association Board of Governors and is on the Board of Directors for Washburn Law's Children and Family Law Center. To learn more about his accomplishments, visit his firm's website.